Using (pink) craft felt (the basic, cheap, polyester, nasty kind) as a base is more stable than I remembered. 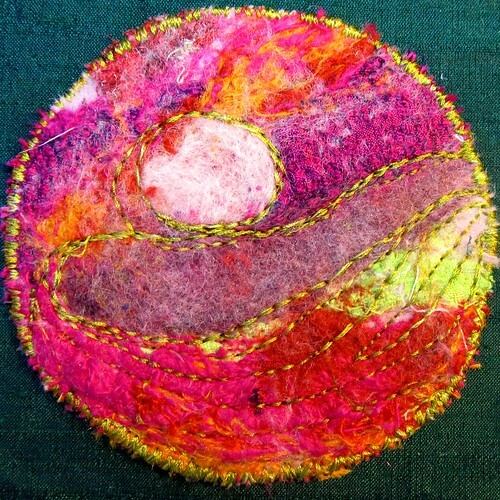 The felt supports some silk thread scraps, silk fabric, and some raw felting wool, all needled together. I pressed the final fabric pretty aggressively. Then I located the most interesting part and cut it out, stabilized it with iron on mid-weight interfacing, and stitched it using the sewing machine. I used two strands of thread this time, both the same acid yellow-green as yesterday. They show up better, but I'm having tension issues now. I should fix those by the end of the month! Practice, you know. I also, finally, changed out the felting head on the felting machine. One needle broke, out of five, and from straight aggravation I'd been using it as it was. It took an enourmous scrimmage, including six trips up and down the stairs to fetch various very large and very small tools from the toolbox. However, nice sharp needles affect the texture of the fabric, in a good way, so I'm glad I did it, and faintly embarassed that it took so long to get to it. i am so impressed by your tenacity with this project!